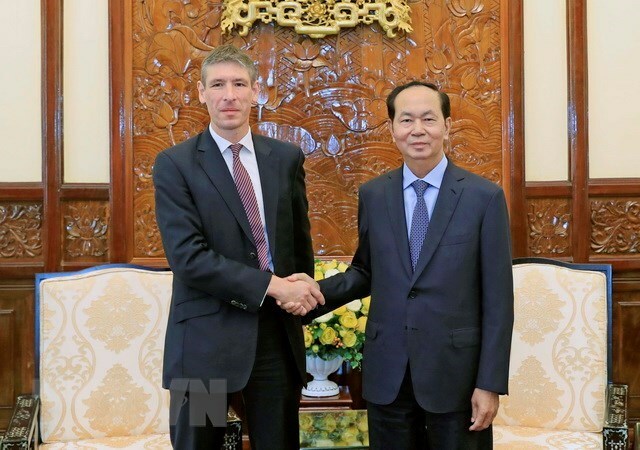 Hanoi (VNA) - President Tran Dai Quang has called on Vietnam and the UK to fully tap their potential for cooperation in order to boost the bilateral strategic partnership in a more comprehensive, pragmatic and effective fashion. At a reception for outgoing UK Ambassador Giles Lever in Hanoi on June 7, the President affirmed that Vietnam attaches importance to promoting the strategic partnership with the UK, one of the country’s priority European partners. He said since the two countries established diplomatic ties 45 years ago, especially after the formation of the strategic partnership in 2010, their relationship has developed in all fields. In the context that Vietnam and the UK are celebrating the 45th anniversary of diplomatic ties in 2018, the two countries should increase cultural and sport exchange programmes to reinforce their friendship and mutual understanding, he said. The President suggested both sides maintain and enhance the exchange of high-ranking delegations to create political trust, step up economic, trade and investment links, expand collaboration in national defence-security, crime combat and peacekeeping operations, and maintain their affiliation in culture, health care, sports and education-training. The leader also urged the two countries to carry forward mutual consultation and support mechanisms at multi-lateral forums and within the framework of the United Nations. He thanked the UK for backing the stance of Vietnam and the Association of Southeast Asian Nations (ASEAN) on handling issues regarding the East Sea in order to ensure peace, security, and aviation and navigation safety and freedom in the waters. For his part, Giles Lever highlighted remarkable progresses in deepening the strategic partnership, emphasising that cooperation in economy and trade between the UK and Vietnam has developed at the fastest pace as compared with other partners of the UK in the Asia-Pacific region. He also spoke of the expansion of bilateral cooperation in new realms like scientific research, public health and national defence-security, particularly peacekeeping operations. He reaffirmed the UK government’s commitment to maintaining collaboration with partners in Asia-Pacific as the country withdraws from the European Union (EU). The UK will continue renewing economic cooperation with Vietnam in many areas such as business climate improvement and green city building, he said. The diplomat informed his host that on the occasions of the 45th anniversary of the bilateral diplomatic ties and 25 years of operation of the British Council in Vietnam, the UK will organise a range of meaningful activities in Hanoi and Ho Chi Minh City to celebrate such events. Lever affirmed the UK’s strong support for the early signing and ratification of the EU-Vietnam Free Trade Agreement and the Vietnam-UK Bilateral Free Trade Agreement. The UK will increase investments in Vietnam in the areas that match the two countries’ potential, while collaborating with Vietnam to ensure the respect of international law and ensure peace, security and navigation and aviation safety and freedom in the East Sea, he said.